ST. GEORGE – A bill presented by Rep. Chris Stewart, R-Utah, supporting the creation of the contested “northern corridor” passed out of committee Wednesday and now advances to the floor of the U.S. House of Representatives. Officially titled the “Washington County, Utah, Public Lands Management Implementation Act,” the bill designates right-of-way for a northern transportation route and eased utility access through the Red Cliffs National Conservation Area. County and municipal officials have long argued that the northern corridor is needed to help ease severe congestion projected to come with increasing growth over the coming decades. Gov. Gary Herbert’s Office has estimated Washington County will have a population of nearly 235,000 by 2040. “Right now our traffic’s not too bad, but as the area grows, traffic along St. George Boulevard and the northern part of Bluff Street, there will be so much traffic it will be gridlocked,” Washington County Commissioner Zachary Renstrom said Thursday. Renstrom and other officials maintain that the promise of a northern transportation route that would connect between Interstate 15 and state Route 18 was promised to the county in the Omnibus Public Lands Management Act of 2009. 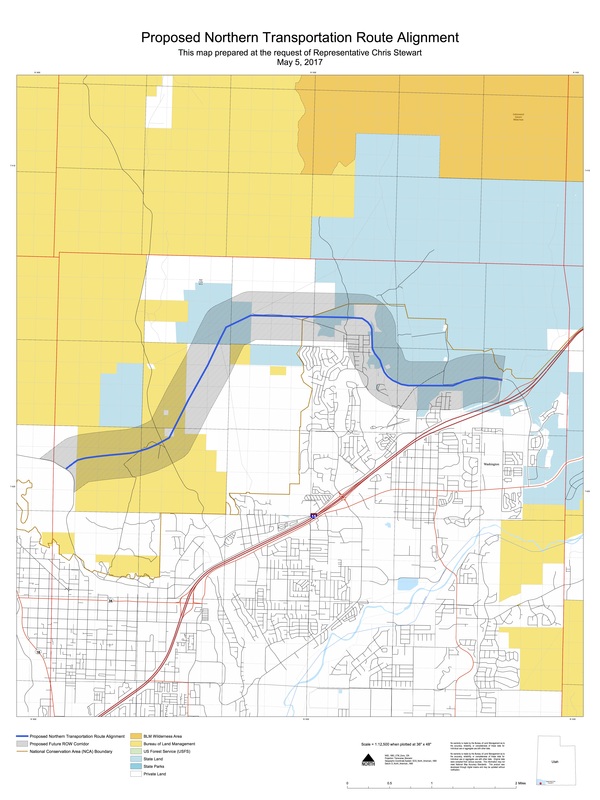 The route proposed in Stewart’s bill would start at the Washington Parkway/Exit 13 interchange of I-15 and run west where it would connect with Red Hills Parkway that further connects to SR-18. 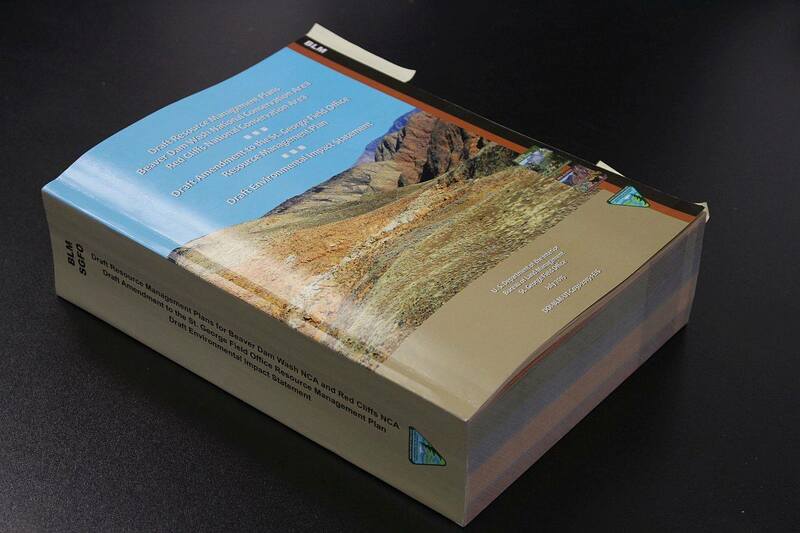 However, when the Bureau of Land Management released its draft resource management plans for the Beaver Dam and Red Cliffs national conservation areas in late 2015, they didn’t exactly allow for the possibility of the northern corridor. The BLM plans “created an environment that made that impossible,” Renstrom said. County officials and other involved parties have been meeting with the BLM on a regular basis to discuss the northern corridor and other areas of concern, Renstrom said. He added the county and BLM nonetheless have a good relationship and are working together to try and solve the issues at hand. Conservation groups, such as Conserve Southwest Utah and the Southern Utah Wilderness Alliance, have objected to the concept of the northern corridor. 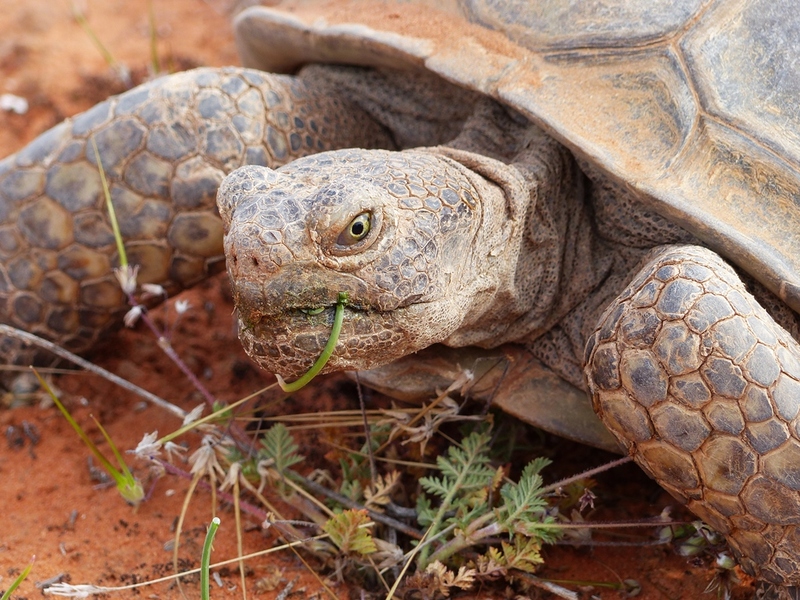 A concern is that bisecting the Red Cliffs Desert Reserve will disrupt the ecosystem and possibly threaten the Mohave desert tortoise population that resides there. “The proposed bill designates a four-lane highway through the NCA, circumventing all environmental and federal regulations protecting this area, subverting Congress’ basic intent stated in the 2009 Lands Bill,” the group said. Despite objections from environmental advocacy groups, the bill’s passing out of committee is seen as a positive for the elected officials of Washington County and the City of St. George. Elevated roadway with those who use it pay for it (tollway). Period. Problems solved. No one is gonna pay for a toll road here; they’re gonna take the long way to avoid it. And the cost of an “Elevated roadway” is astronomical. You’re delusional. I’m a frequent user of the trails in Red Cliffs and a huge proponent. I’m not really opposed to the Northern Corridor plan in general but I just don’t understand what this particular version of it gets us that a much more modest version of it couldn’t do. The problem I have is the western terminus. Dumping all of the traffic on Red Hills Parkway sets us up for capacity problems in the near future on Snow Canyon Parkway. Earlier iterations of the Northern Corridor, as I remember them, showed it bisecting Highway 18 several miles North of the current Utah 18-Snow Canyon Parkway overpass and then dropping down into Ivins and heading West to Old Highway 91. I suppose too much development has taken place in Ivins now for this to ever happen. It’s a shame a corridor was not preserved. Why not, for now, just improve the traffic connection to Snow Canyon Parkway from I-15 near the current St. George Blvd Exit? Maybe a new exit at the new underpass near the mall? As the area grows out, a real Northern Corridor could run from Leeds, North of Red Cliffs NCA and Snow Canyon and then connect with Old Highway 18 and a presumed Western Corridor. This version mostly goes through sagebrush and ties in so that it benefits lots of people (it will make sense for Green Valley, Ivins, Santa Clara, Highway 18 north, etc). The version you mention (further up Highway 18) goes through some incredible sandstone formations, amazing petroglyphs, and yes, a lot of recent and proposed development. It also makes the norther corridor much less useful for those in Green Valley, southern Santa Clara, etc. Out of the five proposed northern corridors this is the only one that really makes any sense to me. It will get by far the most usage and benefit without too much impact on the tortoises. The only ones that have a “real” complaint are the poor Green Springs folks, and they’re just being NIMBY’s. This proposed route will actually draw east-west traffic up there (ie. it will actually get used a lot). All of the others except the tiny southern one wouldn’t get used much (and the southern option is all “impact” with no value). And it has minimal impact compare to the others. Put those together and it’s by far the best ROI. from the northern corridor onto northern green springs drive. benefit of being a full time resident, when in reality they live in like California or some other state. the other wacko plan for Saint Georges water park could happen. koo koo for Saint George planning commision. They are pushing for this even though there is a preserve here. I know none of you care about the tortoise, but they were there long before this corridor was even mentioned. The roadway will bisect the populations and harm them in the worst way. THAT is why I proposed the elevated roadway, they can come and go as they please. This is all for the convenience of humans and developers. Once this is opened up to the developers, there will be nothing but gridlock all over the place. Make the people who will be using the road to pay for it. I won;t be using it so why should my taxes pay for it? This is exactly like the new water park in St. George. It is being built in the worst imaginable place. BUT no one cares because the roads (traffic problems) will then become Washington’s problem and St. George will not help pay for the improvements to keep cars flowing… Let those who want it pay for it. Humans – 1, turtles, tree huggers, rock lickers – 0. Nolan, let’s be real, don’t you pretty much hate everyone and everything? The republican mormon political leadership around here cares nothing about the tortoise or conserving anything, for that matter. Their priority is to please their land developer cronies and reap the kickbacks $$$. It’s greed above all else. These are our Wash co. politicians. What can ya do? I guess it doesn’t surprise me that there is no discussion of alleviating the real problem-unmanaged, uncontrolled growth. Right now the “plan” seems to be slam those houses in there as fast as the builders can get them in. Traffic congestion isn’t the only consequence of their intended and desired growth; water supply, air quality, crime and other general qualities of life loss will most likely come with the anticipated and proposed growth. Isn’t there anyone in government intelligent enough to realize this and think of some solution? I know it would be contentious and controversial but how about limiting building permits to some sensible level? In conversation with building contractor friends, I get the sense that they’d rather have steady, moderate, controlled growth rather than the boom/bust cycles that occur with economic downturns. That helps them get and maintain competent, reliable staff. I know, “dream on”.